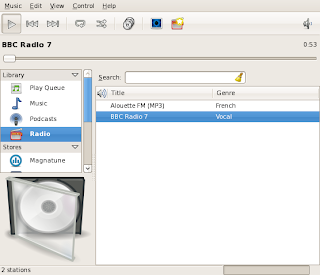 Rhythmbox is the media player to use, however, out of the box, it does not support the BBC Radio stations (due to the RealAudio Codec). Once installed, Rhythmbox will be able to decode the real-audio. In order to add stations, you must know the URLs of the streams. For the BBC, I used the Reciva website, clicked on the play now link for the station, and then look in the source of the pop-up window to find the URL of the stream. If you want more visualisations, simply install the gstreamer0.10-visual and libvisual-plugins through the package manager. Now the Mandrive One 2009 image does not recognise any MP3 encoder. A popular encoder is lame, so in order to include it, you need to use some other sources for your downloads. Adding the PLF sources does the trick. Once the gstreamer plugin is included, you need to Activate the MP3 encoder in the Audio CD Extractor (SoundJuicer). Do not delete or deactivate ones you don't need - for some reason if only the MP3 one is activated, SoundJuicer produces oga files! After shutting down / restarting SoundJuicer, you will be able to rip MP3 files. Navigate down the tree on the left to get to: "/system/gstreamer/0.10/audio/global"
Note that even thoughSoundJuicer has found an album art picture, it does not store this inside the MP3 file, along with its tags. If you want the pictures inserted, you need another application - I download the images from Amazon, and use easytag to embed them. I also prefer my songs to be stored in Genre directories, i.e. genre/artist/aaa - nn_ttttt, but SoundJuicer does not have a variable for the Genre, so Ill have to live with manually moving these files about after the event! Lexmark 7500 Series Printer - GPL? I am yet another frustrated Linux user, frustrated at lack of support from peripheral suppliers (such as Lexmark, when it comes to the 7500 Series Printer). Note that the X7500 appears to be an office printer, and the X7550 appears to be a home printer. Lexmark are inconsistent in their naming, for example, I don't believe that the X7500 firmware update mentioned on their webpage can be applied to the X7550 printer (which Lexmark says is in the X7500 series). When scanning / printing, the port 9100 is used. Using Wireshark, it is clear that the sequence 'HBN3' is passed over this interface. IPP (TCP 631) - Timed Out! Now, port 10000 looks extremely interesting. When you connect, you get the LXK: prompt, and the prompt has built-in help. Now this looks like an embedded Linux release - I wonder where the GPL sources can be downloaded? Update: Well, on the 30th April 2009, Lexmark uploaded their GPL code to ftp://ftp.lexmark.com/swlab/. It would be great if this happened before, and I'd have found a note in the user manual telling me where the sources could be found! But it's good to see that Lexmark have done the right thing in the end! "Corresponding Source conveyed, and Installation Information provided, in accord with this section must be in a format that is publicly documented" - GPLv2. I've recently bought the HP J4680 for £90, which works over a wireless network for printing, scanning and faxing, all with Linux.